Mexico represents a huge saving potential to a lot of people in terms of buying drugs. Mexico is also known for the huge illegal drug deals that usually take place in the country. This makes it hard to determine which medications are legal and which ones are not. Consumers who face this challenge usually don’t want to get into trouble with the law. For this reason, they will seek knowledge to know which medications are legal and available in Mexican pharmacies. You will be able to purchase prescription medications from Mexico. But, you have to be very careful about who is selling the meds to you. Being careful will ensure that you don’t end up falling into a scammer’s trap and having to take fake drugs which will harm your health. The first thing that consumers will ask themselves is whether the act of purchasing drugs from Mexico is actually legal. This is a question that cannot be answered without having to seek information from experienced people. For this reason, we headed out to Quora to check out the answer to this question. We were able to come across information provided by people who were knowledgeable about the issue. 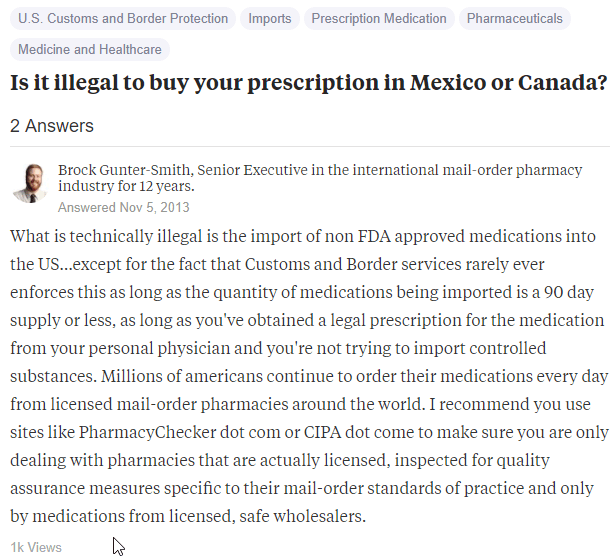 The Quora user who had posted the question wanted to know whether it is illegal to buy prescription meds from Mexico or Canada. Brock who was the first to answer the question says that technically the only thing that is illegal is to import medication that has not been approved by the FDA. He also says that the Custom and border services rarely enforces this as long as the medications that are being imported are a 90-day supply or less. He says that as long as you have obtained a prescription from your doctor and you are not trying to import controlled substances, then it is legal to import meds. He says that millions of Americans continue to order their medications every day from licensed mail-order pharmacies around the world. He recommends the use of pharmacychecker.com or cipa.com to make sure that the buyer is dealing with pharmacies that are actually licensed, inspected for quality assurance measures specific to mail-order standards of practice and only buy medications from licensed and safe wholesalers. 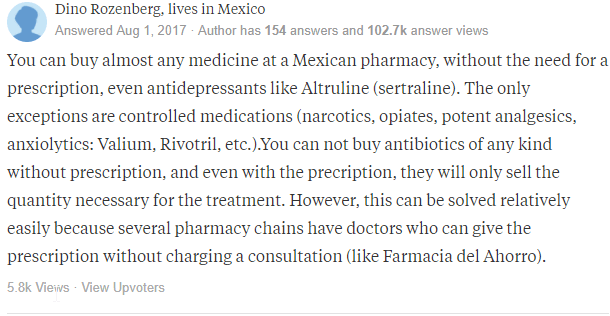 Dino who is a Mexican resident says that you can buy almost any medication at a Mexican pharmacy without a prescription. He says that you can purchase drugs like antidepressants such as Altruline (sertraline). The only exceptions that cannot be bought without a prescription are controlled drugs such as narcotics, opiates, potent analgesics, and anxiolytics. Examples of these drugs include Valium and Rivotril. He says that it is not possible to purchase any antibiotics without a prescription. Even with a prescription, Mexican pharmacies will only sell the quantity that you need for your treatment. He reports that some Mexican pharmacies have doctors who offer consultation services. Thus lowering the need for a prescription when buying drugs. 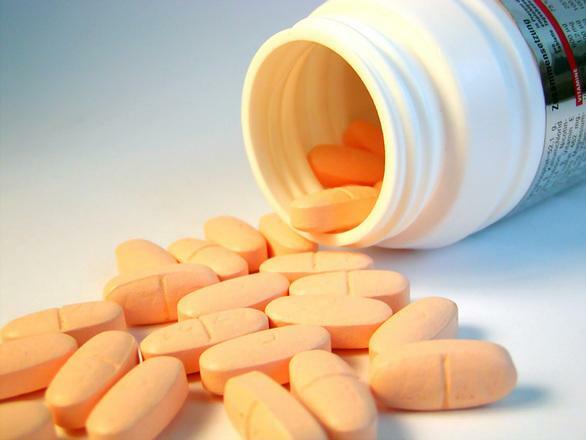 From the above answers, it is clear that you can get your medications from Mexico. However, if your drug requires a prescription, you will need to have one before the drug can be dispensed. However, as Dino says, there are pharmacies that offer consultation services and hence eliminating the need for a prescription. You have to take care when buying your drugs. Not all Mexican pharmacies are safe. You should stick with investigated and proven stores only. Our catalog only contains top-rated and approved pharmacies. The general price for Amoxicillin is $39.71 when bought in a local store. This same dug cost only $12.03 in a Mexican pharmacy. This gives the buyer a chance to save $27.68. This is a 70% saving. The same saving is available for the other drugs. This shows that you have a huge potential of saving a lot of cash if your meds are originating from a Mexican store. However, not all of them will deliver the real thing. Some will steal from you while other will deliver fake meds which will harm your health. Therefore, always stick with proven stores only. Your safety when ordering drugs online starts with where you are ordering your meds. As long as you choose a safe Mexican drugstore, the chances of receiving what you are ordering in time will be very high. The second thing is about payment. Always make your payments using a credit card. You will be able to dispute your charges if the deal between you and your pharmacy turns out to not be what you were expecting. Mail-order is the method that works the best. You will be able to have your drugs with you within a period of 14 to 28 as long as you order from a safe store. There are numerous drugs that are legal prescription meds in Mexico. At the same time, there are also numerous fake drugs in Mexico. The difference between legal and illegal meds is on whether you have a prescription for the drug and if it is a controlled drug or not. The majority of controlled drugs are illegal. Getting legal drugs from Mexican online pharmacies is not hard as long as you know which pharmacy is safe. We help you out by providing you with the top legal pharmacies. Check our catalog to find one pharmacy that you can use. This will keep you safe.